Toddler - £36.99 Small - £36.99 Medium - £36.99 Only 5 left! The truth about the Gotham crimefighting scene is that no one has as much style as Batgirl. Oh, sure, Batman gets the cave, the British butler, and the batmobile. And Robin gets to live in Wayne Manor. But their suits, well... they leave something to be desired. They're stiff, don't allow for much movement, and sure as heck don't let the wearers relax and have fun when it's time to quit fighting crime for a while. Batgirl takes a different approach to the work-life balance. She knows how to beat up the bad guys and look glamorous at the same time. 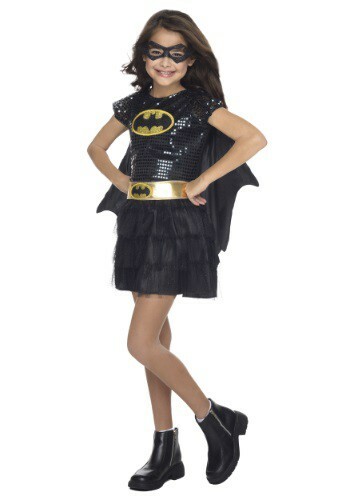 So why not let the crimefighter in your life suit up as Gotham's toughest girl this Halloween? The Child Batgirl Sequined Costume is the one that suits her fashion sense and her take-no-prisoners stance on evildoers. Hitting on both points isn't always easy in the crimefighting business, but this suit pulls it off. The sequins on the top half give this dress a sparkle that will blind the likes of Joker and the Penguin before they can carry out their dastardly plans. And the black satin skirt has a glittery sheen that will make Batgirl want to wear this suit... even on the nights when she's not fighting crime! This Child Batgirl Sequined Costume has everything she needs to take on the bad guys. It comes with the dress, a bat-inspired cape, a gold-colored belt with the iconic Batman logo on the front, and an eye mask that's sure to protect your girl's secret identity!